I believe it is fair to say that Big, starring Tom Hanks, is one of the better examples of the “age swap” genre of films. You know the ones, where a child ends up swapping bodies with a grown up, quite often their mother or father, after making a wish near some kind of magical artifact. Whilst these films can be fun, they are often quite formulaic. Big was slightly different though, and all the better for it. It may still have featured a magical object (in this case a fairground fortune telling machine called Zoltar Speaks) and a child making a wish to be grown up, but in this case the child doesn’t swap bodies with anyone else. Instead, they wake up the next day to find themselves fully grown. The child in question in Big was a lad named Josh, who suddenly becomes a 30 year old man with the mind of a 13 year old. Josh first runs away from home when his mother thinks he is a kidnapper who has taken her son, and having nowhere else to go ends up at his school where he manages to convince his best friend, Billy, that he actually is Josh. Billy helps Josh to get a job at a toy company as a data entry clerk, but it isn’t long before he befriends Mr. MacMillan, the head of the company and gets promoted to an executive job as a toy designer! 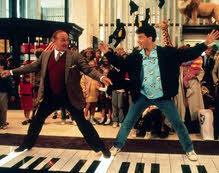 This all happens because Josh happens to be talking to the boss one day in a toy store, when he comes across a giant floor piano, and in a very memorable scene Josh and Mr. MacMillan play Chopsticks together on the keyboard. Apparently the pair really did play the tune for real, as is evidenced by the very occasional wrong note. 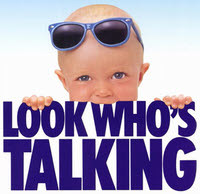 Released as the Eighties were coming to an end, Look Who’s Talking was the first in a trilogy of films whose unique feature was that the viewer could hear what the young baby in the film was thinking. Technically the film probably slots into the romantic comedy genre, but given that the spoken thoughts of the youngster were what provided most of the films funny moments, it is easy to overlook the fact that the film did actually have a plot. Mollie Jensen (Kirstie Alley) is an accountant who finds herself pregnant after having an affair with one of her clients, Albert (George Segal). Despite promising to leave his wife and help bring up the child, Albert ends up breaking Mollie’s heart when she discovers him with another woman (and not his wife either). She is so angry that she storms off, but then goes into labour, so hails a cab driven by a guy called James (John Travolta), who rushes her to hospital and is then mistaken by the hospital staff as being the father of the baby, and ends up being Mollie’s birthing partner. Mollie gives birth to a baby boy, who she names Mikey (and who’s thoughts are voiced by Bruce Willis). Annie was one of my sister’s favourite films when we were growing up, so it was a film that I saw myself quite a bit, and I have to say I too have good memories of it myself. The film was released in 1982 and stars Aileen Quinn as the titular Annie. The film is a musical and was based on a stage musical from the late Seventies, which in turn was based on a newspaper comic strip Little Orphan Annie which dates back to the 1920’s. 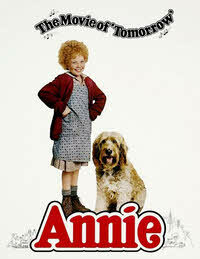 Annie is an orphan with a curly mop of very orange hair. She lives in an orphanage run by Miss Hannigan, who makes the lives of Annie and the other orphans an unpleasant one. One day though, Annie’s life changes for the better, when the secretary of Oliver Warbucks (Albert Finney), a hard headed billionaire, turns up at the orphanage looking for a child to live with Warbucks for a week as a publicity stunt. Annie is chosen, and whilst Warbucks is not best pleased (he would have preferred a boy), as time goes by Annie starts to melt his cold heart, and eventually Warbucks adopts Annie as his own daughter. Whilst happy at leaving the orphanage, Annie has always been convinced that she is not actually an orphan, and that her mother and father are still out there somewhere. Warbucks decides he will try to help Annie out, and makes an appeal for her parents to come forward. No, the asterisk in the title isn’t a mistake, nor is the lack of capital letters, that really is the full title of this film from 1987. Dropping capital letters seems to be the in thing these days (particularly in company logos for some reason) but this film beat the trend by at least 20 years! 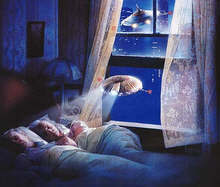 *batteries not included is a heart warming mix of two classic storylines, given a science fiction twist to make it all seem more believable. The first storyline is one beloved of Hollywood when making kids movies – I call it the Nasty Property Developer™ – you must have seen countless films (mostly second rate ones it has to be said) based on this premise. The Nasty Property Developer™ has bought all the land surrounding except that which the hero of the film owns, who is refusing to sell, so the NPD™ sends in a bunch of hired goons to force them out. The second storyline is the classic fairytale The Elves and the Shoemaker, where a poor unfortunate is aided by magical creatures in their hour of need. I this particular case though, it’s little robotic spaceship thingies rather than elves. In noting the above two story influences I’ve pretty much spelled out the plot of the movie without being at all specific, so I’ll fill in some of the details. The heroes of the piece are Frank and Faye Riley, who own an apartment building and restaurant in a run down part of New York. They are an elderly couple, Frank being a hard working sort whilst is wife Faye is going senile. The pair are played by husband and wife team Hume Cronyn and Jessica Tandy, who also starred together in that other Eighties classic Cocoon. If it were not for this week being Super Mario week, this film would not otherwise have made it on to these pages, given that it was released in 1993. In a similar way to how people generally remark that sequels to films are never as good as the original, there is a similar rule to films that are connected in some way to video games. Most generally tend to end up being classified as stinkers, and the Super Mario Bros film is normally looked on as a classic example of a bad videogame movie. Looking at the evidence you have to agree, and even the actors who appeared in the film like to distance themselves from it. 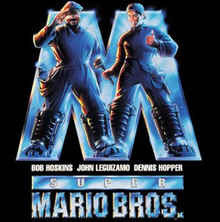 Bob Hoskins, who played Mario, has publicly stated that he sees this movie as being his biggest mistake of all time, and the late Dennis Hopper (who played King Koopa) wasn’t too fond of it either. The strange thing about the film is that it has most of the main features of a Mario videogame, but they are all slightly wrong. King Koopa is a humanoid evolved from a dinosaur, rather than being a giant turtle. They chose to use Daisy (who was the damsel in distress from Donkey Kong) rather than Princess Peach as the love interest, and they made her fall in love with Luigi rather than Mario. I have to admit that my taste in films hasn’t really progressed that much from when I was a boy. Show me a film with an alien, a spaceship or a superhero and I’m hooked. 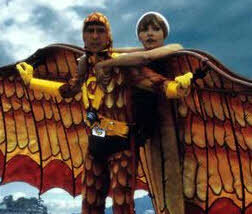 Todays post is a film about one of the latter, a superhero. Well, a superhero of sorts anyway. Condorman was a Walt Disney film release from 1981, which starred Michael Crawford (yes, the hapless Frank Spencer from the seventies sitcom Some Mothers Do ‘Ave ‘Em) as Woodrow Wilkins. When I first watched the film I half expected him to still have the slightly effeminate sounding voice, so was shocked to hear Frank Spencer talking with an American accent! Woodrow, or Woody for short, is a comic book writer, but he works to a set of principals which mean he doesn’t include anything in any of his stories that couldn’t happen in the real world. Hence this is why the film opens with Woody plunging into the River Seine in Paris whilst attempting to fly with a gigantic set of wings strapped to his back. Woody is in Paris visiting his friend Harry, who works for the CIA. Harry is ordered to find a US citizen to perform a document swap in Istanbul, and Woody is only to pleased to help out his friend. However, when he arrives in Istanbul the Russian citizen he is supposed to be swapping papers with turns out to be a Russian spy called Natalia. Sneaking in at the end of the decade, Disney’s film Honey I Shrunk The Kids was released in 1989 and became a very successful kids comedy adventure film, spawning several sequels, a TV show and even an attraction at Disneyland! 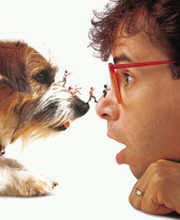 Wayne Szalinski’s (Rick Moranis) is a struggling inventor who has been tinkering in his attic trying to invent a shrink ray, a machine that is capable of shrinking anything to a fraction of it’s original size. Initially tests of the device don’t go well, with the items to be shrunk usually ending up exploding, but all this is fixed when one of the next door neighbours kids throws a baseball through the window, knocking the machine. Wayne’s kids accompany the two boys from next door into the attic to retrieve the baseball, and find themselves shrunk to the size of ants in the process. The kids try to raise the alarm but end up getting taken out with the rubbish, and find themselves in an even worse predicament, stuck at the bottom of the back garden. Given their newly reduced size they find the garden a particularly hazardous place to be, having to fend off giant insects (well, giant to them anyway), massive water droplets from the garden sprinkler and even a robot lawnmower! Meanwhile, realising what has happened, Wayne goes searching for the kids in the back garden, rigging up a rope and pulley system which he dangles from whilst wearing a massive magnifying glass, so as not to crush the kids accidentally under foot. OK, I know it was released in 1977, but with two thirds of the original Star Wars trilogy coming out in the 1980’s I think it’s only fair to include the first film on this site. 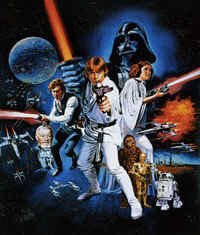 Of course, back then the film was simple known as Star Wars, only officially becoming “Star Wars Episode IV – A New Hope” when the more recent trilogy was made. To me, I think it will always be simply Star Wars though. If by some strange quirk of fate you’ve never seen the film, or don’t know the story, then rather than describe the plot like I usually do with films here’s a recap provided by a little girl of the tender age of three. She gets most of it pretty much spot on. 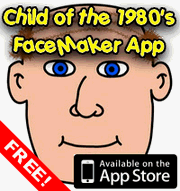 Thanks to Jonathan from Raised in the 80s for bringing this great video clip to my attention. Watching this video got me thinking about my memories of Star Wars from childhood. When the film was released I was only four (showing my age there) but it must have made some kind of impact on me as I definitely remember my Dad taking me to the cinema to see it. We didn’t go to the pictures very much when I was small, in fact the only other films I distinctly remember going to see were The Jungle Book, The Aristocats and Moonraker!